1. A logo designed in MS Paint? Over 40% of Sainsbury’s management are women. One in seven bottles of wine bought in the UK comes from Sainsbury’s. 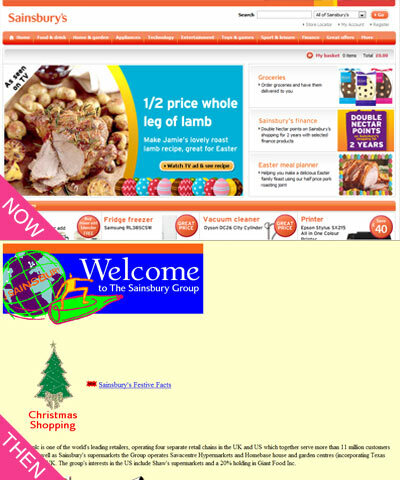 Sainsbury’s is the UK’s largest retailer of meat and poultry. The number of sausages sold by Sainsbury’s in a year, when placed and to end, would reach three quarters of the way round the world. Placed end to end, the number of cans of food sold by Sainsbury’s in a year would reach round the equator. Placed end to end, my interest in these facts would last 10 seconds. 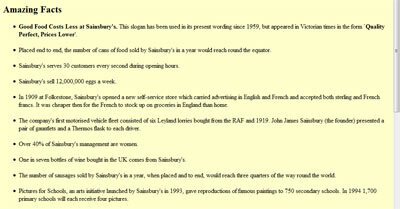 This entry was posted on March 18, 2010 at 8:33 pm	and is filed under Sainsburys. You can follow any responses to this entry through the RSS 2.0 feed. You can leave a response, or trackback from your own site.